This Victorian-style rowhouse was built in 1891 for $5,000 by Edward Manning. Mr. Manning was an architect working on the Library of Congress, which was completed in 1898. The front door of the house faced East Capitol Street; furthermore, the address of the house was 200 East Capitol Street. This is illustrated in the stained glass above the door. All of the stained glass is original to the house. For historical purposes, Florida House is still considered The Manning Home. When Mr. Manning built the house, the land between the house and the front steps of the Capitol was vacant. The Supreme Court and the Library of Congress had not been built at the time. Consequently, the Mannings had an unencumbered view of the United States Capitol. In a house built over 100 years ago, you can imagine that there have been numerous owners. 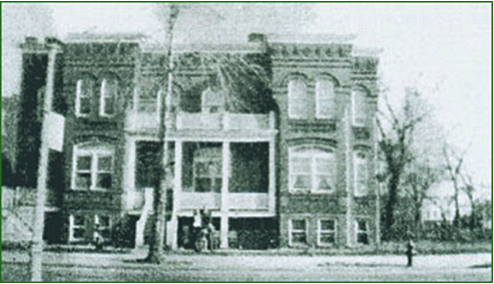 Mr. Manning sold the home to William Michael and his wife, Nannie. They lived in the lower level of the townhouse and maintained the second and third floors as a rooming house for income. Mr. Michael started many businesses in D.C. and owned a dairy, a 5¢ & 10¢ store, a movie theater, and several pieces of real estate. He sold the townhouse to Senator Rice Reynolds for $25,000 on February 2, 1942. Senator Reynolds of North Carolina lived here during the early 40’s with his 5th wife, Evelyn Walsh McLean. The grand mirror in the living room was a possession of the Reynolds. In the late 60s, Lawton and Rhea Chiles were visiting Washington D.C. on vacation with their young children. They got lost and found themselves on Embassy Row. One of the children said “Let’s go to Florida’s embassy, and they will tell us where we are.” They explained that only foreign countries had embassies and that states did not. The idea, however, intrigued Mrs. Chiles. Lawton Chiles was first elected to the Senate in 1972. He served for eighteen years in Washington. During their first year in Washington, Rhea Chiles was walking by 200 East Capitol Street. At the time, the neighborhood was unsafe and the properties were unsightly. For these reasons, most people did not come east of the Capitol. Mrs. Chiles found the house in total disrepair – almost to the point of needing demolition. The second floor had caved in and the windows were boarded up. Homeless people were living in the basement. There was a For Sale sign on the property. Mrs. Chiles remembered her child’s comment about “Florida’s Embassy.” With that as her vision, she arranged the purchase of the property with $5,000 of her own money and $120,000 raised from friends in Florida. For $125,000, Florida House was created in what is now a million-dollar, century-old house. Mrs. Chiles preferred the sound of Number One Second Street over the original address of 200 East Capitol Street. She boarded up the front entrance and opened the back door as the formal entrance. When the community became accustomed to the new address, she reopened the “front” door, and it goes into the garden. The location of the house is certainly remarkable. 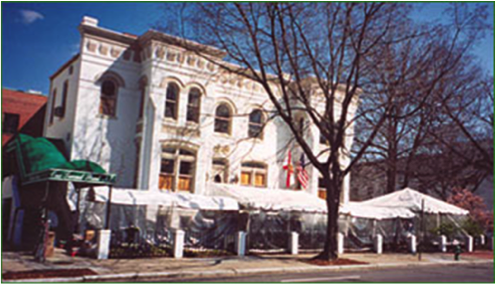 We share the four corners of East Capitol Street and Second Street, NE, with the Supreme Court, the Jefferson Building of the Library of Congress, and the Folger Shakespeare Museum. Mrs. Rhea Chiles became the principal innovator and founder of Florida House in 1972. She had a dream of creating an embassy for Floridians in Washington, D.C., offering a hospitable respite for weary travelers. She supervised the historic restoration of the 100-year-old Manning House that came to be Florida House. She presently serves as Chairman Emeritus to the only state embassy in the nation. Rhea partnered with her husband, Lawton Chiles, during his 55 years of public service. Lawton served as a Florida State Representative, United States Senator and the Governor of Florida. Rhea served as the president and CEO of Florida House from 1973 until 1988. Rhea is also a practicing artist. Her watercolor called Window to Washington, depicting the beautiful view of the Capitol from the house’s upstairs window, is the artistic signature of Florida House. Copyright © 2015 The Greater Fort Lauderdale Chamber of Commerce. All rights reserved. Designed by Goodman Public Relations.